Bounce houses offer many hours of fun for young children. While it may look like a straightforward toy, there are several differences between various models. The question is: how do you figure out what best bounce house to buy is? To answer this question, we’ve looked at various features (slides, space, weight capacity, etc.) and compiled a list based on what we’ve found. 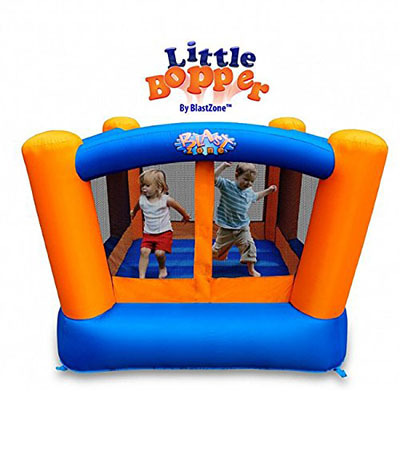 If you’re working with a small budget, the Blast Zone Little Bopper Inflatable Bouncer may be the best bounce house to buy. It’s a small bounce house that’s perfect for two young small children. It’s designed for safety as it is made of multiple stitched reinforced walls. As for the netting, it comes in a soft yet durable material. The compact size also makes it great for travel. Just take the rolled up bounce house, and you can inflate it within two minutes for safe play. This bounce house is for indoor play due to its light weight. 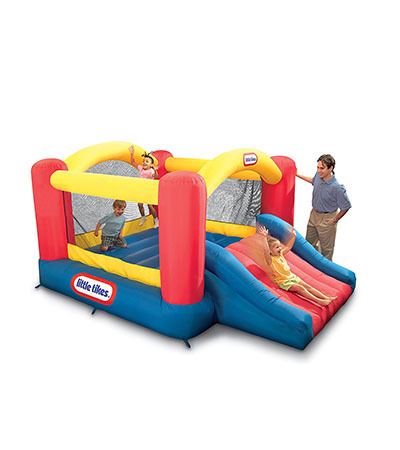 If you want something with more room, Blast Zone also offers their Castle Inflatable Bouncer. It has a fun castle design that kids will love. It also adds a slide for extra fun. Because it provides more space, up to three young children will be able to play in the bounce house at once. Of course, this is backed up by the fact that the weight capacity of the bounce house is increased to 300 lbs in this model. Just like the Little Bopper, it is constructed of multiple stitched material and soft nets for durability and safety. If you want to throw play dates with multiple kids, then the Blast Zone Ball Kingdom Inflatable Bounce House may be the best bounce house to buy. It has enough space for up to five kids and has a max supporting weight of 400 lbs. This model also has the castle design which kids will love. On top of that, it also has a small slide that leads to a pool area. This pool area can be filled with soft balls for a fun ball pit (the bounce house does not include the balls). That said, this bounce house is in the upper price range. Therefore, make sure you plan on really putting it to great use. 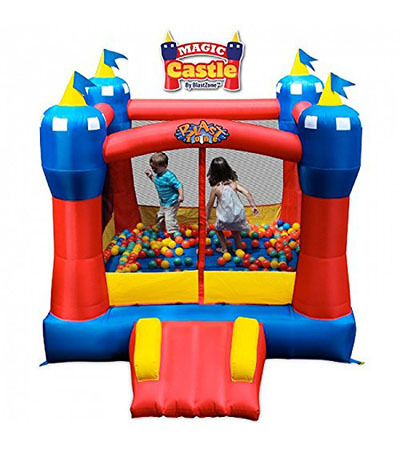 If you want something similar to the Blast Zone Ball Kingdom Inflatable Bounce House but don’t want the ball pit, this is the model you should look at. 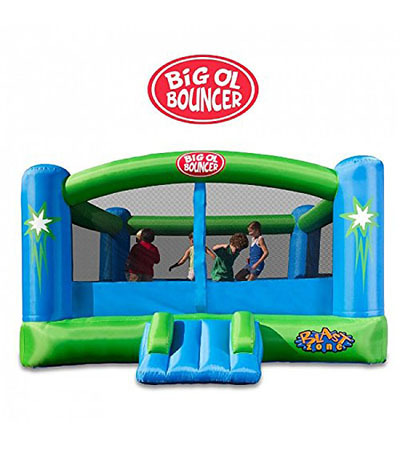 The Blast Zone Big Ol Bouncer Inflatable Moonwalk offers a little more space than the previous model and allows for up to six kids to play in it at once. This makes it perfect for birthday parties and other kid events. Looking at the safety measures, the bouncing area is surrounded by safety netting on all slides and has the same safety features as other Blast Zone models. Keep in mind that there should be adult supervision whenever numerous kids are going to play in the bounce house at once. The Little Tikes Jump ‘n Slide Bouncer is an excellent alternative to the Blast Zone Little Bopper Inflatable Bouncer. If you’re looking for a bounce house that’s small, affordable, and has a slide, this may be the best bounce house to buy. There is enough room for two kids playing at the same time. It also has a higher height than some of the other models, making it harder for kids to climb over the walls. It has safe mesh walls and a large slide that can be installed on the open part of the bounce house. 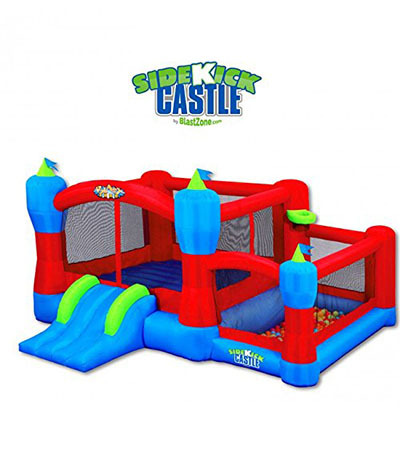 Another great Blast Zone bounce house is the Sidekick Bounce House, Ball Pit, Slide, and Hoop. This is the best bounce house to buy if you want your kids to enjoy many different activities with the bounce house. It has a slide, separate space for a ball room, and a hoop that kids can throw balls into. Such a model is perfect for up to six kids that need to burn that extra energy. Keep in mind that only four kids can be in the jumping area and two in the ball pit at once. Kids will need to take turns as the weight capacity is different for each area. 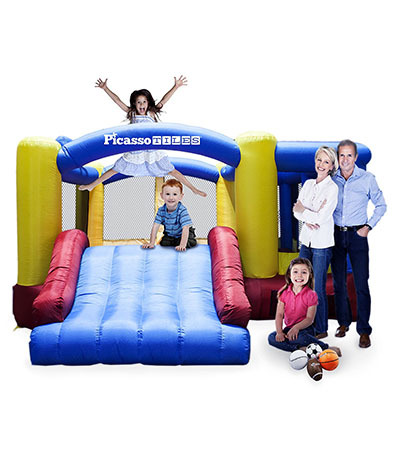 Another great alternative is the PicassoTiles KC102 12×10 Foot Inflatable Bouncer. This model has a jump slide, dunk playhouse, and a basketball hoop. It also has an extended slide that larger kids will really enjoy. What’s great about this particular model is that it offers a lot of space and features. Despite all these goodies, it is priced very low. It has the standard safety features found in other bounce houses (soft mesh netting and reinforced fabric). That said, this bounce house is for three children and only supports up to 250 lbs. Another great selling point of this type of product is that it is straightforward to assemble. Most of them come with their own inflating mechanism. Once you lay down the bouncing space on a clear surface and couple it to an air pump, you’ll have to wait several minutes only for it take shape. However, keep in mind that before letting your kids jump on their new bounce house, you should give it a test run yourself. Carefully climb on the inflated surface and start bouncing a bit to check that everything is in order. These are the bounce houses we found when we looked for the best bounce house to buy. Your purchase will obviously depend on various factors like space, features, and price. All of the models on the list came with everything you need to set up the bounce houses and were easy to assemble. They also came with reliable safety features. This way, you can rest at ease knowing that your children will not get hurt due to the material or construction. If you’ve used any of the bounce houses on this list, let us know what you think. I would love to more than anything to get a bounce house for my twins but the issue is that we have no room for it. That is the most frustrating thing about it. They would absolutely love it. But it won’t work for us. Hello, Amanda! This can be fixed by going on a trip with your beautiful family to the local entertainment park. There surely is some type of bounce house for the twins to have lots of fun while the parents can enjoy a refreshment. As for your small room situation, there are many trampoline alternatives that take little space. Follow our Facebook page to discover more recommendations of this sort! Summer is on its way out but next year I want to get a bounce house for my kids that are under 10 years old. This way I can get it in the spring so they can enjoy it for the summer. I like how the Blast Zone Big Ol Bouncer Inflatable Moonwalk sounds. Hello, Faith! I’m sure your kids will be over the moon when they see your surprise. The Blast Zone bounce house is definitely a good budget-friendly choice. Be sure that no more than 2 kids will use it at a time. This is useful info. My little one is turning 3 and I want to get her a bounce house for her birthday. She will absolutely love it as she has so much energy pent up. I have no idea where she gets it from, but this will be a great outlet. We have a theory that all kids are somehow connected to some inexhaustible source of energy that scientists have failed to discover as of yet – agree? I have seen my neighbors put their bounce houses on their driveway for their kids and their kids’ friends to play in. I have wondered how secure any of these really are because my worry is that a child could fall out and injure themselves- and end up on my property. Do you see why I am worried? If a child falls out and gets seriously injured on your property, for God’s sake call an ambulance! 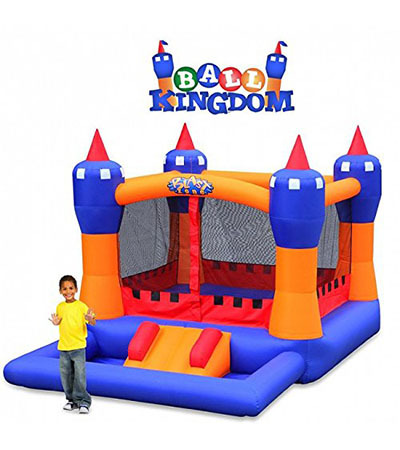 The Blast Zone Ball Kingdom Inflatable Bounce House is one of the best kiddie trampolines around. My triplets dig it and they can have a fun time in there for the longest time. once they are done they are ready for a good long nap. I love this because it keeps them busy and them out of our hair. It is fantastic and again, so highly recommended.